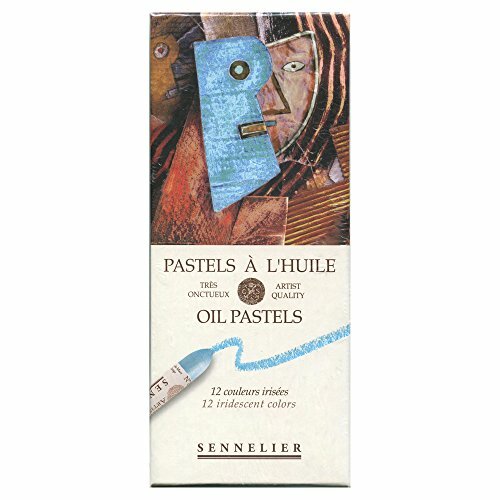 Sennelier artists' quality oil pastels were originally developed in collaboration with Picasso in the 1940s. These creamy, lipstick-like pastels are rich in pigment, cover well, and have outstanding opacity and lightfastness. They may be thinned with turpentine and worked with a brush. Compatible with all media and can be applied to most surfaces such as paper, canvas, wood, or metal. Great for mixed media works. Set of 12. Colors in iridescent set are white, black, aluminum, pale gold, rich pale gold, riche, red copper, transparent blue, white Perl, golden Perl, red gold and reddish brown. Colors in bright set are white, pale blue, lemon yellow, black, yellow ochre, burnt umber, green yellow, green medium, mandarin, delft blue, permanent intense red and blue.